In a small hamlet, near the town of Ollantaytambo, a few hundred devotees hold festivals in honor of the Virgen del Carmen, known locally as Mamacha Carmen, patron saint of the mestizo population. 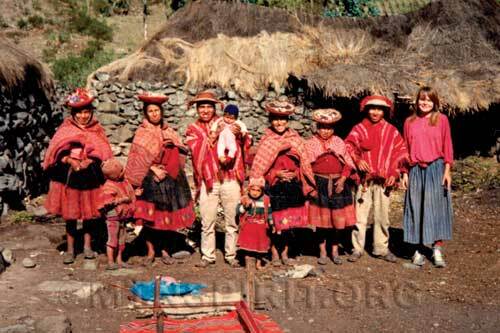 The gathering, that raises the curtain on these days of celebrations is held in the main square, where troupes of musicians play their instruments while richly dressed choirs sing in Quechua. The setting gives way to a series of ingenious choreographies that portray events in Peruvian history. The main and much bigger celebration of Virgen Del Carmen is in the town of Paucartambo, about four hours from Cusco, Peru. 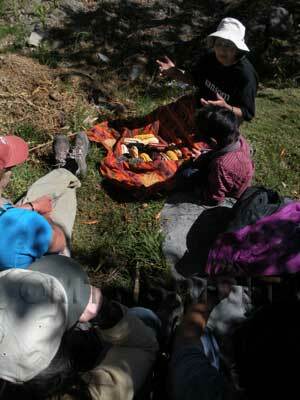 Mountain Spirit Institute participants, guide Guillermo Seminario, and host Anna Sequeros are in this clip. We stumbled upon Maribel Torres Leon’s Museum of Biodiversity in Ollantaytambo, Peru, when we walking on a side street one afternoon. The motto on her business card states, “Trade rightly, Sustainable Tourism, Cultural Identity”. Check out the video, and if you like it, please support Maribel’s work by either visiting the museum (see address and telephone number below), spreading the word about her good work, and/or making a donation. Well done Maribel! Before I knew it I had a baby on my back. We were being shown how the Peruvian weaving process works from start to finish. We were in the town of Willoc for the afternoon, above Ollantaytambo, the gateway to Machu Picchu. We were being shown how the wool is shorn, carded, and spun, then dyed and weaved on a back-strap loom. The women showing us were wonderful and very gracious. I’d been there a number of times before taking a few MSI participants up to the mountain village, known for its weavings. 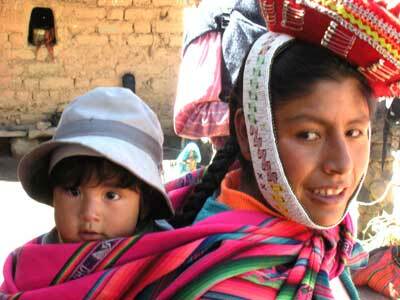 I have always been curious how the woman use the mantas, or clothes to carry everything from children to corn. I had been shown the day before how to fold and tie the knot but still was asking a woman who carried a child how it was done so the baby didn’t fall out. Her idea was to show me by handing over the the whole lot, baby and manta to me. As she helped me tie the knot, I thought, “this knot is as important as any climbing knot I’ve tied over the years. It better be good” The young one hung out with me for about fifteen minutes when he decided he’d had enough and wanted his mom again. I still need to figure out exactly how the folds in the material go, so the baby doesn’t fall out. I’ve got the knot down though! I highly reccomend losing your stroller for this manta. We sell them at our fair-trade webpage, and I can even post some directions on how you too can carry everything from a child, to corn or even your groceries from Trader Joe’s, Hannaford’s, New World. 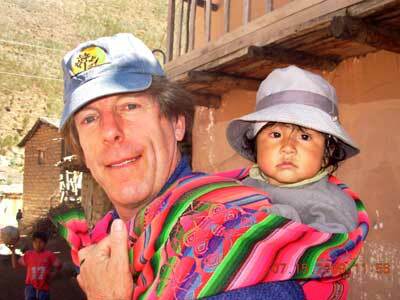 Tomorrow, Amanda and I head back for Anna’s place in Ollantaytambo. I was just there a few weeks ago with our participants. I look forward to our second visit this year. A few weeks ago, we spent an afternoon getting tutored by Anna on how she grows amazing varieties of corn. She took us down to her fields in the Sacred Valley, just a stone’s throw from her home, and showed us the different sorts of corn, and how she plants them. She explained that these are not mono-species. 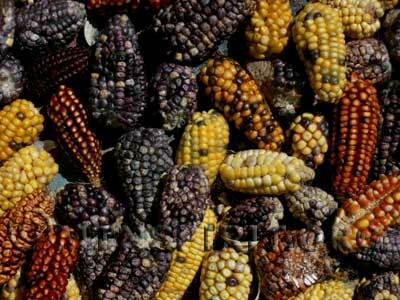 Most of the corn cross-breed every season creating a multitude of colors and styles of corn, used for everything from Chicha to toasting corn. She explained that most times every row will have a mix colors, which in fact makes them stronger against disease and drought. She also explained how all the other neighbors work together to share various tasks such as irrigation and maintaining the fields. Unlike Monsanto corn, these varieties reproduce and are carried down through generations. Not to say there weren’t problems. Some twenty years ago, there were serious health issues with the villages due to pesticide use in the fields. Cancer rates were high and people were really being affected. Now though, things are mostly if not totally organic. Most of Anna’s corn goes to feed her family and chickens, and doesn’t reach the local market. She also grows grains to feed her guinea pigs which she sells to neighbors and other villagers. We’ll keep you posted on what we learn next at Anna’s.